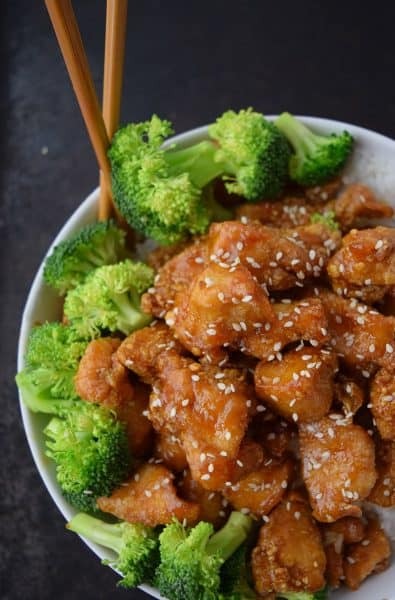 Honey Sesame Chicken – even better than take out! this is one of our favorite dinner recipes It’s easy, delicious and full of flavor without a ton of breading. Asian dinners are often one of our go-to’s for a busy weeknight, and some of our favorites are Slow Cooker Asian Beef, Shrimp Hibachi, and Honey Soy Chicken Kebabs. Today, I am delighted to post my Honey Sesame Chicken Recipe. I know I shared my recipe for Slow Cooker Asian Beef last week. I had planned to share my penne pasta bake recipe today, but the pictures looked really odd. As in the pasta was so neon yellow, you might wanna put on some shades. But this isn’t just any substitute…this is the secret weapon recipe. Yes, it’s THAT GOOD! This sauce is delightfully sweet and mild. I often make double batches of this because it is the best leftovers and easy lunches to take to work. I remember the local Chinese take-out place in college had this comic strip taped to the front door. I can’t remember the exact contents but it was something along the lines of an important US official begging to trade classified secrets in exchange for the recipe for Moo Goo Gai Pan. I am probably butchering it, but being a college student who ate there 2-3 times a week, I could see how important Chinese take-out was to the economy of our country. Tag it, bookmark it, rolodex it. No more needing to travel to your local take-out dive to get your fix. Next time your craving Sesame Chicken, you will remember that you now have the recipe. As for me, after a long day of trying to finish up the kitchen and to sit down with the family with that for dinner….oh yeah, life is good. Delightfully sweet and mild, your local take out chinese place will hold no competition! Pat the chicken dry and cut into 1-inch pieces. In a medium bowl, combine sesame oil, sugar, 2 tbsp soy sauce, and pepper. Coat the chicken in the mixture, cover, and marinate in the refrigerator for 1 hour. Heat vegetable oil to 375 degrees in a skillet. In a dish or large bag, mix the cornstarch and flour together. Work in 1-2 batches depending on your skillet size. Dredge the chicken pieces in the cornstarch, shaking off any excess and place in oil. Cook 3-5 minutes or until golden brown and cooked through. Remove from pan and place on a paper towel lined plate. Pour the excess oil out of the pan, reserving about 1 Tbsp. Adjust to medium heat. Add the garlic and ginger and cook until fragrant, about 30 seconds. Add the rice (white) wine, hoisin, soy sauce, honey and chili sauce; bring to a simmer. In a measuring cup, mix the remaining 2 tablespoons cornstarch with 2 tbsp water and whisk. Add to the sauce and simmer for 1-2 minutes, until the sauce thickens. Add in the chicken to the sauce and toss to coat. Squeeze lemon over dish. Garnish with sesame seeds and scallions. Thank you for stopping by and sharing, Kimberly! I wouldn’t go a week without joining in on the fun at your party! Sounds amazing! My husband loves Sesame Chicken. Thank you for linking up to Party Time and we hope to see you again next week!